1. 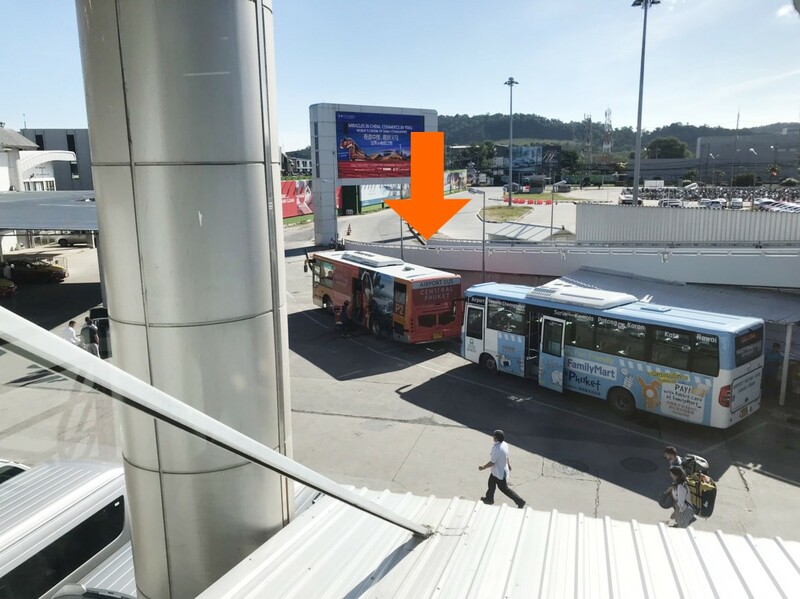 Where can I find bus stop of Airport Bus at the Phuket International Airport? 2. 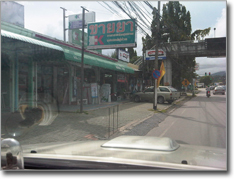 How much does it cost from/to Phuket International Airport to Phuket Town? How long does it take? 3. 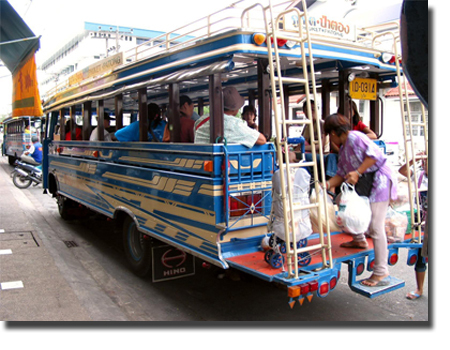 Do you have bus service that goes straight from Phuket International Airport to Patong Beach, Kata Beach, or Karon Beach? And how much would it be? 4. 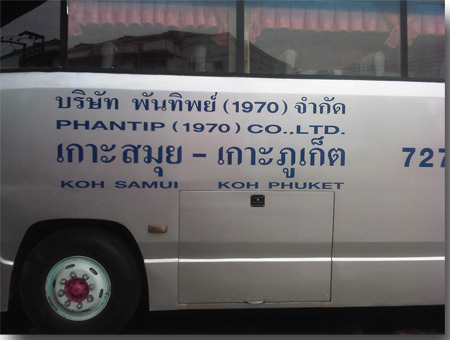 Do you have bus service that goes straight from Phuket International Airport to Rassada Pier to Phi Phi Island? 5. Do I need to make reservation in advance? 6. I arrive at 19:00hrs. Is your service still running at this time? And if so, where do I catch the bus from? 7. I arrive at 23:35hrs. Is your service still running at this time? 8. 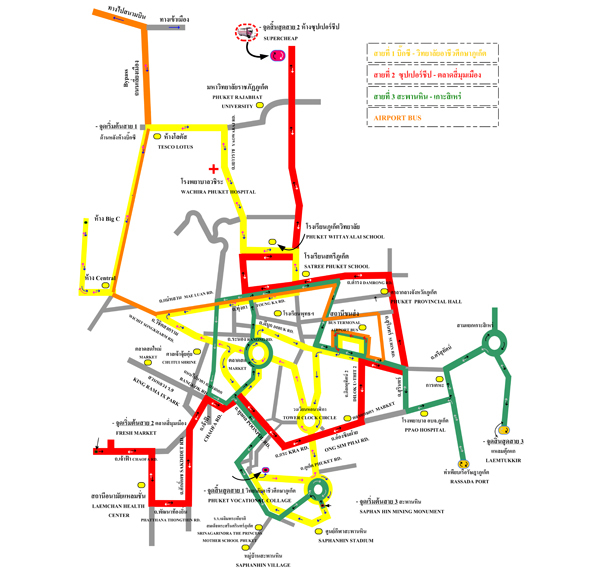 How can I go to Suratthani Province or Samui from Phuket? 9. 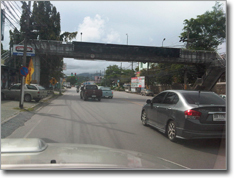 How can I go to Khaosok from Phuket? 10. How can I go to Krabi from Phuket? 11. Please suggest good hostels. 12. 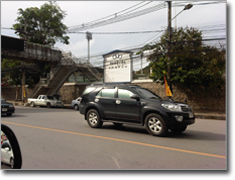 Do you have Share-A-Ride or Join-in Ariport shuttle service? 13. 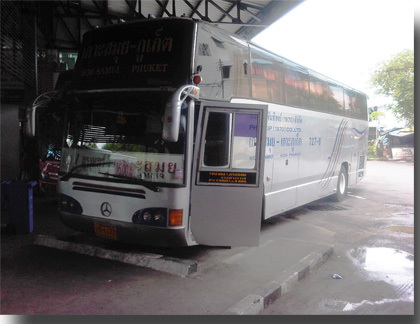 I want to go to Airport but I don't want to go to Phuket Bus Terminal. 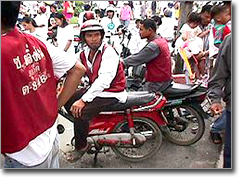 Can I hop on around Central Festival Phuket (as known as Central) or Big C? 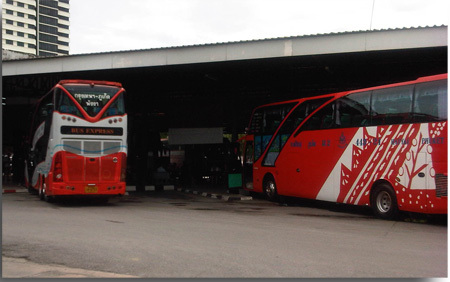 Q: Where can I find bus stop of Airport Bus at the Phuket International Airport? 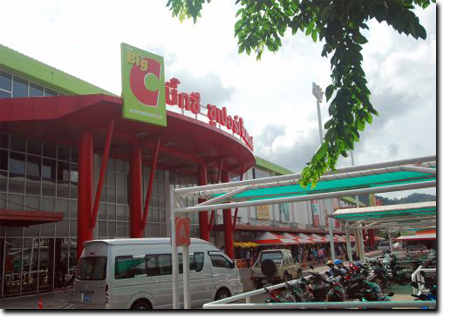 A: We are located at Phuket Airport (Domestic Terminal). Upon arrival, walk to the exit of the domestic terminal. Bus Stop is located just outside the terminal on the left handside...Orange color buses are us! 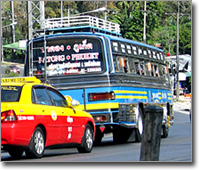 Q: How much does it cost from/to Phuket International Airport to Phuket Town? How long does it take? 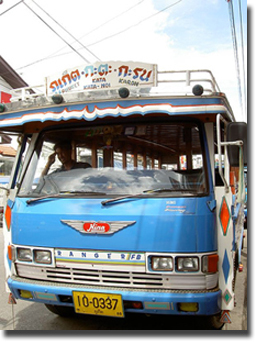 A: The service is 100 Thai Baht/passenger with a total approximate travelling time of 1.15 hour. 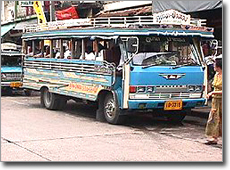 Q: Do you have bus service that goes straight from Phuket International Airport to Patong Beach, Kata Beach, or Karon Beach? And how much would it be? 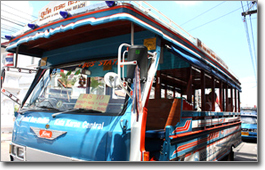 Q: Do you have bus service that goes straight from Phuket International Airport to Rassada Pier to Phi Phi Island? 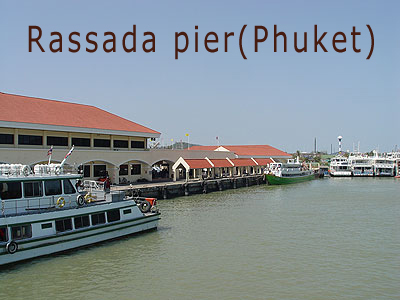 A: At the moment, we do not serve directly to Rassada Pier. 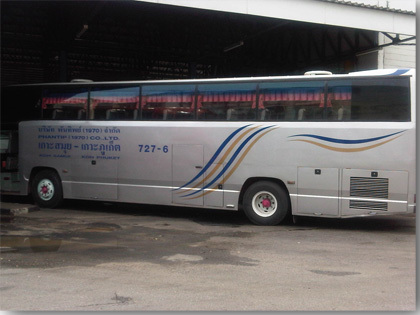 From Airport, use the Airport Bus to Phuket Bus Terminal (Phuket Town). 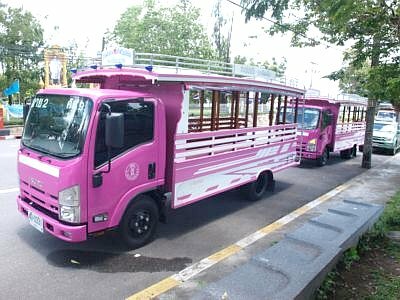 Then, you should catch a motor bike taxi , Tuk Tuk or the cheap Pink Municipality Bus [in Thai: Rod-May-OrBorJor] Route 3 to go to Rassada Pier. 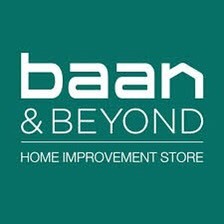 Remember bargain hard. It is the fun part of traveling in the Kingdom. Or us share-A-Ride airport shuttle www.SamuraiFive-O.com. Q: Do I need to make reservation in advance? A: There is no need to make a reservation in advanced. 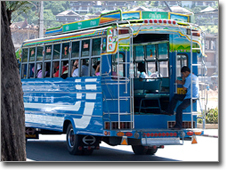 You can just get into the bus and buy ticket with the ticket collector. Make sure you keep the ticket for the ticket auditors. Q: I arrive at 19:00hrs. Is your service still running at this time? And if so, where do I catch the bus from? If you arrive International Terminal, you must walk to the Domestic Terminal. 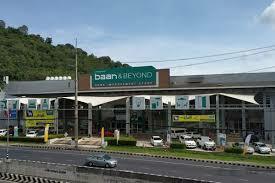 We are located on the exit of the domestic terminal on the left handside. Q: I arrive at 23:35hrs. Is your service still running at this time? 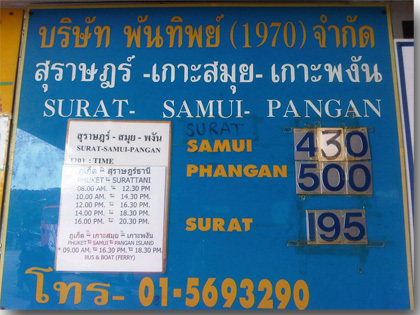 Q: How can I go to Suratthani Province or Samui from Phuket? Q: How can I go to Khaolak or Khaosok from Phuket? Q: How can I go to Krabi from Phuket? A: Here are the suggested hostels in town. Baba House Hotel www.babahousehotel.com One of the best serviced and small hotel in town in my opinion. 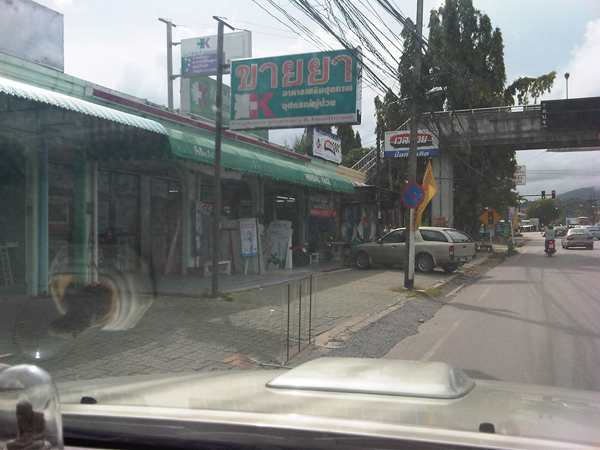 The local and the Thai love it for their space, long pool and friendly staffs. 9 Inn Hostel. http://www.9inn.co.th/ Located not far from the down town market in a walkable distance. This family-run hostel is superb clean, new and nice. Phuket Backpacker http://www.phuketbackpacker.com New dormlike, but I think it miss some charm...perhaps you have to make a call. 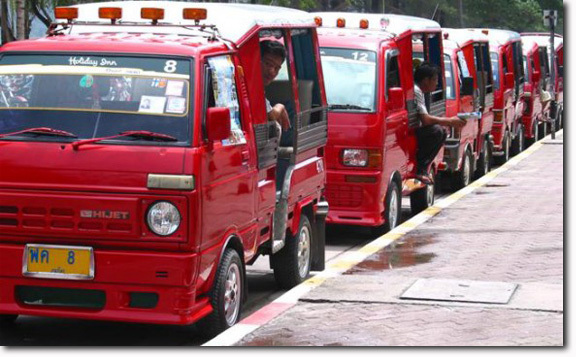 Q:Do you have Share-A-Ride or Join-in Ariport shuttle service? 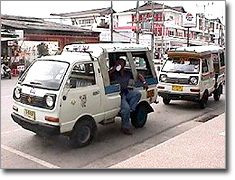 A: You can use the local favorite Share-A-Ride airport shuttle www.SamuraiFive-O.com. A very reliable service. Q: I want to go to Airport, but I don’t want to go to Phuket Bus Terminal. 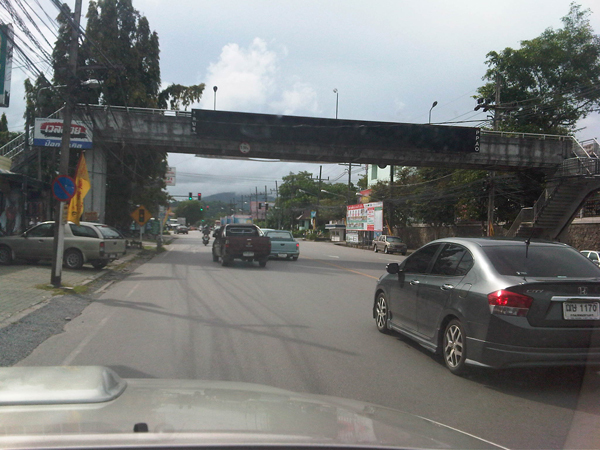 Can I hop on around Central Festival Phuket (as known as Central) or Big C? 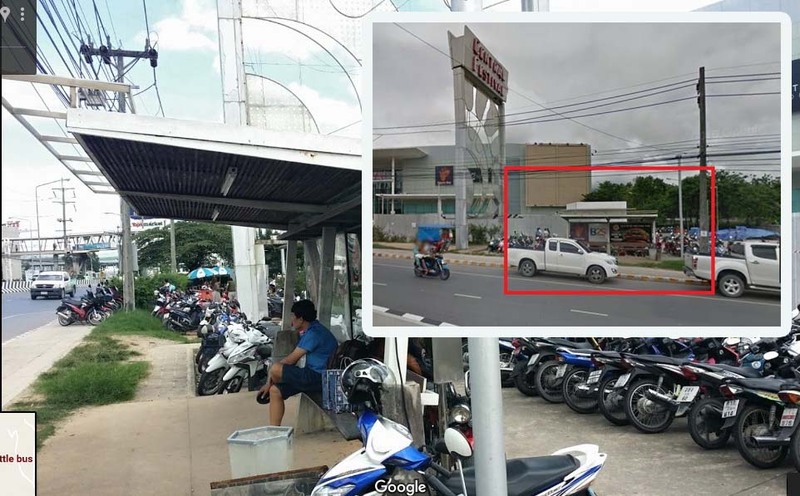 A: Yes, you can wait at the bus stop in front of Central Festival Phuket (opposite of Baan Beyond Home Improvement) or at Big C (underneath the passenger crossing bridge). The bus driver will surely stop and pick you up.